SB19-006 has passed and SB19-1240 has been introduced! SB19-006, Electronic Sales and Use Tax Simplification System, has passed both the House and the Senate as of March 19th. This bill is the first step in Colorado’s tax simplification process. The bill came out of the Legislative Sales and Use Tax Simplification Task Force, created in 2016. It will require the Department of Revenue to conduct a sourcing method for the development of an electronic sales and use tax simplification system including the input of stakeholders. The system would be used by the state and local taxing jurisdictions. SB 006 will allow Colorado’s small businesses to spend their time on their business rather than sorting out the state’s complicated sales & use tax system. Now we are just waiting on a signature from the Governor! SB19-1240, Sales & Use Tax Administration, is another very important step towards simplification in the state. This bill addresses a few areas. First, it establishes economic nexus for purposes of retail sales by retailers without physical presence. Second, it codifies DOR’s destination sourcing rule for state sales tax collection and for sales taxes imposed by a statutory incorporated town, city, or county. It would also establish an exemption for in-state small businesses under $100,000 of revenue to source their sales to origin sales rather than destination sourcing until an electronic system is in place. The bill also addresses issues that arose from the Wayfair decision. It requires marketplace facilitators to collect and remit sales tax on behalf of marketplace sellers if the marketplace facilitators and sellers have entered into a contract stating that a facilitator facilitates the sale of the marketplace seller’s tangible personal property, commodities, or services through the marketplace facilitator’s marketplace. Lastly, the bill repeals outdated references to remote sales and remote sellers that were added with HB13-1295 but are not applicable. HB 1240 has been assigned to be heard in the House Business Affairs & Labor committee, the committee that I chair, on Tuesday, March 26th upon adjournment of the House floor. 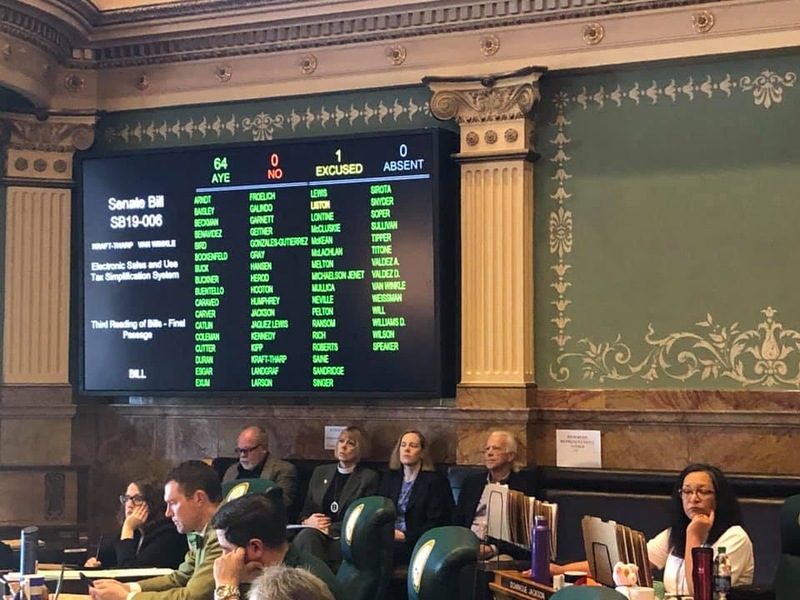 We have been working hard these last couple of years to simplify Colorado’s extremely complicated sales & use tax system and these two bills are important steps in the right direction.